A new case of ash dieback in Derbyshire could be "devastating" if it spreads to the nearby Peak District, a wildlife charity said. The disease has now been found at three sites in the county but the latest near Swadlincote in the National Forest is the first in an established woodland. It is thought to have spread from nearby Leicestershire. 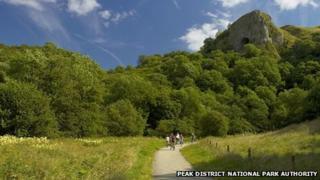 Derbyshire Wildlife Trust said the ash woodlands in the region were "internationally important". The county's first cases of the disease - also known as Chalara fraxinea - were identified in Ashbourne and Clay Cross, which were isolated and easy to remove, according to the trust. Kieron Huston, ecologist at the trust, said: "It does concern us. The ash woodlands in the Peak District are internationally important. "There are all sorts of designations because of the uniqueness of the wildlife they support. There are a lot of rare plants and a lot of species associated with ash. "It could have a devastating impact on the landscape and the way woodlands are spaced." Last year, the Peak District National Park Authority asked visitors to clean their footwear, clothing, cycles and buggies, so that fungal spores were not transferred from one area to another. The Forestry Commission said the threat to the Peak District was a "big concern", and it would hold a meeting with its partners next month to discuss how to tackle the disease.